Damaging weather and predators can mean the difference between a good year and a bad one on the farm. No one knows that better than Charles Stevens, who grows apples and blueberries on his farm near Newcastle, east of Toronto. He’s turned to technology and innovation to protect his apples against hail and frost – and to Mother Nature to help keep his blueberries safe from hungry wildlife. 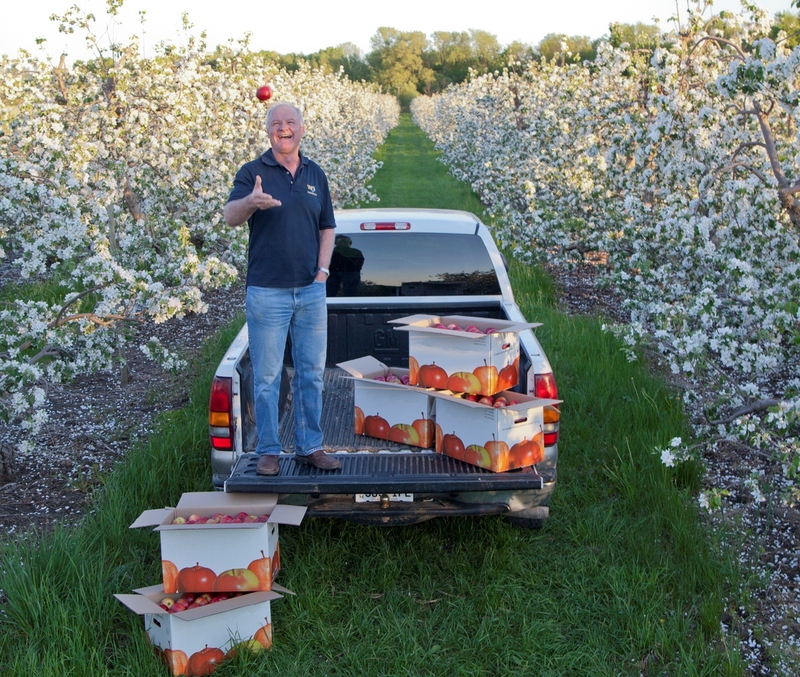 In 2012, early spring frosts devastated fruit trees in some parts of the province, but thanks to the three frost fans Stevens has installed in his 83 acre orchard, his crop remained unaffected. Once temperatures fall below a certain point, the 20 foot high computerized fans automatically turn on and keep the orchard air circulating, preventing frost. Frost damage affects apple volume and quality, resulting in smaller, unshapely and miscoloured apples or in no apples at all if frost hits at blossom time. At Wilmot Orchards, where Stevens farms with wife Judi and daughter Courtney, apples are protected from hail damage by a hail cannon – one of only three in Ontario – that is installed on the property. The cannon is activated by calling a pager number whenever there is the threat of hail, and it shoots sound waves into air every six seconds to break up the hailstones that are forming in the atmosphere. Timing is everything: the technology has to be deployed at just the right time in order to be effective. Damaged trees become extremely susceptible to a disease called fireblight, which can wipe out an entire orchard if the trees are not sprayed within 24 hours. Apples with hail damage are unsuitable for the fresh market, which means they are processed into juice, resulting in a much lower price for farmers. The falconer brings his birds to the blueberry fields about two weeks before the pick your own season starts, to “train” the hungry local bird population to stay away. It’s environmentally friendly and makes for a better picking experience for visitors as they don’t have to fight through the netting to reach the berries, says Stevens. Wilmot Orchards grows nine varieties of pick your own blueberries on 21 acres; all harvested apples are sold into off-farm retail. An on-farm café is open during blueberry season, selling jam, tea, syrup, ice cream and baked goods, many of which are made using the farm’s own blueberries. More information is available at www.wilmotblueberries.com. This article, by Lilian Schaer, is one in a series of profiles on Ontario farmers and farm businesses produced by Farm & Food Care Ontario.